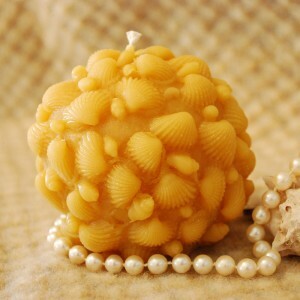 Amazingly detailed ball candle. The original sculpture was a sphere covered with dozens of real tiny shells. Amazing and looks gorgeous when burning because all that great detail is lit from within as the candle burns down. About 4″ in diameter. Burn time about 20 hours. Made of pure fragrant Oregon beeswax and all-cotton wick.